Last Friday at work, we had a Baby Shower/Going Away Party for a fellow employee. For eats, we ordered Jet’s Pizza and Salad. As I do not like eating heavy lunches, I had only salad to eat. I did not try any of the pizza however, it did receive rave reviews from everyone. On Sunday, it was a rainy most of the day and we were tired. At about 5pm, we were already ready for dinner and decided it would be as good of night as any, to try Jett’s Pizza. After reviewing the menu over and over again, we finally placed our order. And, with this online menu review, I found that tonight is the night when 2 Become 1. Jet’s Pizza, on their website, lists their origins. Started in New York, the photo that accompanies clearly shows the name as Jett’s Pizza, with two Ts. However, the company has now become just Jet’s Pizza with only 1. This bothers me. A lot. Moving on…we decided to order a Large Pizza, with the hand tossed crust. 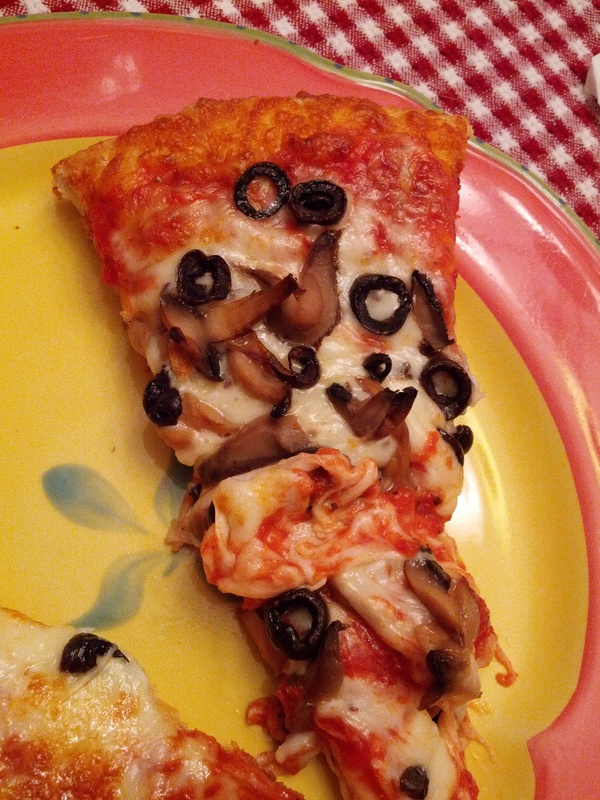 For toppings, we did half cheese and half mushrooms & black olives. We also ordered a Medium Sized House Salad which, I did not take photos of. The total for everything came out to be $20. A big improvement from my $55 pizza debacle a few months back. After a 15 minute wait, our order was ready. We picked it up and brought it home. At first look, the pizza reminded me of Il Primo. Now, I was not going into this pizza expecting it to be hand-made, organic and perfect. Rather, I was expecting good pizza with good flavor but, nothing outside of the norm. I tried a piece of cheese pizza first and it was indeed quite good. The crust was not too thick not too thin and had a nice chew to it. The pieces were not big enough (or designed) to fold however, the crust was sturdy enough to hold up. The sauce did not have too outstanding of a flavor but, I found there to be just enough of it and it did help with the overall flavor of the pizza. As for the cheese, there was nothing out of the ordinary there. All put together, this was a good slice of pizza. Was this comparable to Capri Pizza? No. But compared to Il Primo or Hungry Howies, this was far superior. I then tried a piece of the Mushroom & Olive and liked it even more. There were a TON of toppings on this piece of pizza. 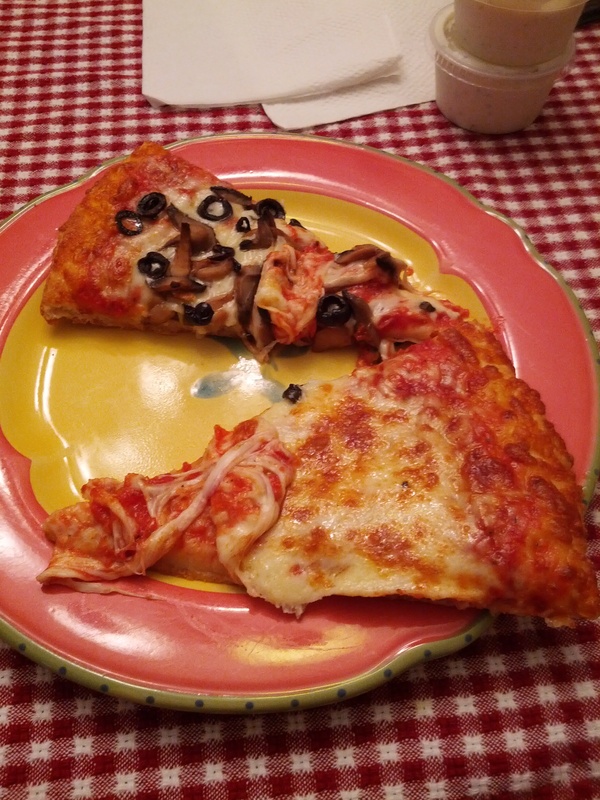 The additional flavors and texture of the mushrooms & olives, really increased my overall liking of this pizza. 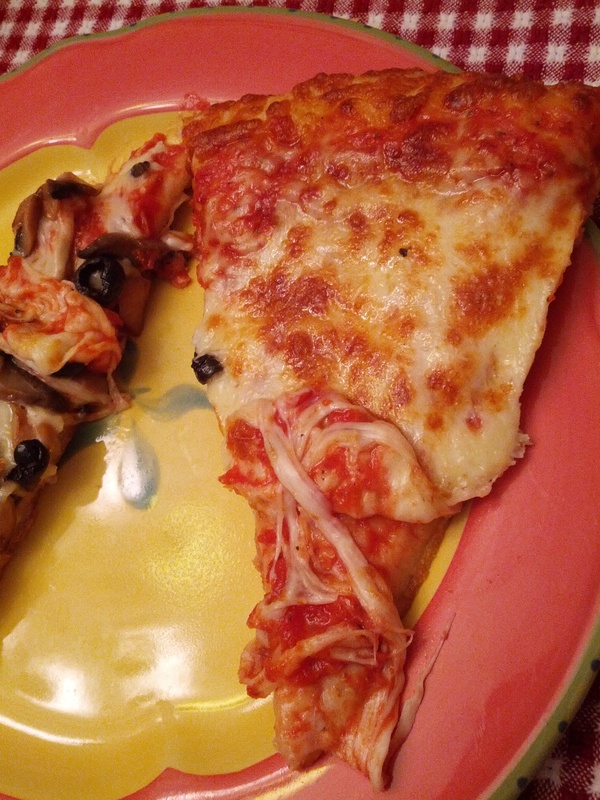 I found these toppings to work really well with the gooey cheese, simple sauce and sturdy crust. I had no problem eating multiple slices of both this and the cheese pizza. I had one piece left over that I stored in the refrigerator and ate cold last night. Well, Jet’s passed the fridge test – the pizza was even better right out of the fridge. This is a standard test that pizza must pass in order for me to eat it again. The salad was also, excellent and huge. For a medium salad, this was easily enough for two meals and I finished it on Monday night. The salad is loaded with toppings and I will be sure to photograph this next time. And there definitely will be a next time. I really enjoyed Jet’s Pizza and I cannot say enough to their service. Both times I ordered this (for work and home), I found the service to be above ordinary. I was greeted with friendly staff who went out of their way to be sure I had a good experience. Next time I am looking for good pizza, at a good price, I will pick Jet’s. If only we could get them to go back to Jett’s, I would be fully happy. Until then, I will be humming Spice Girls all night.